French police officials stand alert as they cordon off a road in Trappes, south-west of Paris on August 23, 2018, following a knife attack. Police shot and killed the man after he killed his relatives and injured another woman in a knife attack. 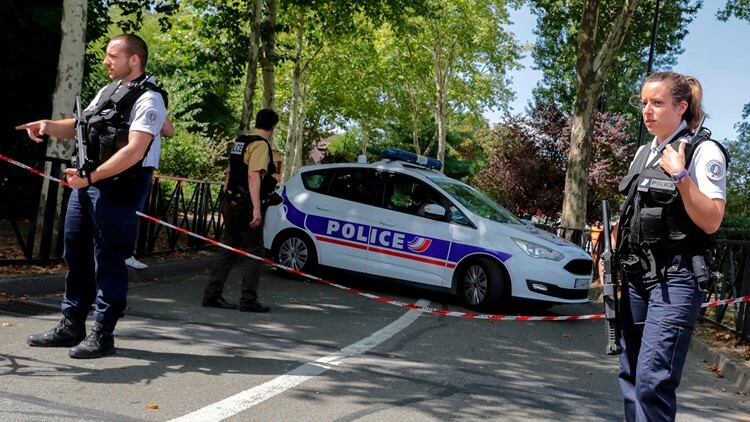 TRAPPES, France — A man with severe psychiatric problems killed his mother and sister and seriously injured another woman in a knife attack Thursday in a Paris-region town, officials said. French prosecutors weren't treating the attack in Trappes, west of Paris, as a terrorism case, Interior Minister Gerard Collomb said. He noted the attacker suffered from serious mental health issues although he had also been flagged for glorifying terrorism. He described the man as "unstable, rather than someone who was engaged, someone who could respond, for example, to orders and instructions from a terrorist organization, in particular from Daesh." Daesh is another name for IS. A long-time friend of the attacker named him as Kamel Salhi, 36. The friend, Said Segreg, said Salhi had no obvious problems, didn't abuse drugs or alcohol and wasn't fervently religious. A government official confirmed Salhi's name and age. The official spoke on condition of anonymity because he wasn't authorized to discuss such details publicly. John Leicester reported from Paris. Associated Press writer Lori Hinnant contributed to this report from Paris.